Ah the annual day of tears, crying, screaming, and a new twist this year: running through the parking lot with Daddy in chase! Our health insurance provides free flu shots and we take advantage of it. Now before those of you who are anti-vaccine start harping on us, remember we have a child with congenital heart disease and one of the first questions his cardiologist asks is "is he up to date on his immunizations and has he received his flu shot?" For our little guy, a simple cold that ends up with a bacterial ear infection could mean a hospital stay, so we don't mess around. We get all the shots, end of discussion. I think fear of needles is a learned behavior. Early on, Nathan had a nurse who said "this is going to hurt, a little like a bee sting, don't worry" or something to that affect. Of course he freaked out, who wouldn't with that set up? Benjamin, who had quite a few invasive procedures like heart surgery, being on a respirator, multiple I.V. 's, a VCUG, and countless blood draws all before he was even four months old, just lived life like getting a shot was something to be tolerated. Certainly not fun, but nothing to get particularly worked up over. He was so good about shots that every nurse who gave him one commented that they had never seen a child like him! What a joy! And then about a year and a half ago I scheduled both boys to have their annual physicals on the same day and time. I thought it would make it easier not to have to go to two appointments- just get it all done at once. I was wrong, so wrong. Both boys required a shot, and the medical staff though that Nathan, being the "brave" older brother, could go first and then calm the little guy's nerves. Dumb, silly, stupid move. I didn't even think to say anything, I just got prepared for holding Nathan down with the help of two other nurses while a third actually gave the shot. All the while Nathan is screaming and kicking and swearing how he hates all doctors, hospitals, and parents and wishes them all a painful, horrible, awful death. Little Ben sat on the table and watched this and of course when it was time for his shot, he imitated everything that brother had done. And now, when I say we are going to the doctor, Ben's response is to start crying and ask if he has to get a shot. These are active boys who daily ride skateboards, scooters, and bikes, and experience blood loss and bruising from these activities at least as often as they enjoy them. They love to wrestle and bonk heads and body slam one another, all of which has to hurt far more than a shot would. I'm working on trying point that out, but logic is completely lost on these two. Oh well. We have a string of CDC recommended vaccines lined up prior to our relocation to Macau, so we'll have lots of practice at trying new and creative ways of breaking them of the screaming and crying habit. Cross your fingers and say a little prayer on our behalf. I can so relate to this post. 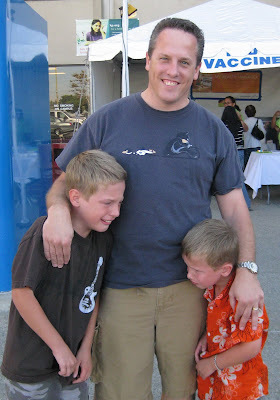 My boys also have a fear of needles! All 3 of them scream when it's time to get shots. Good luck on the next appt.